The Nile Scribes are excited to inaugurate ‘Meet an Egyptologist,’ a new blog series of interviews with leading Egyptologists from around the world. From answering questions about their life and career, they will also introduce you to their research interests and perspectives on the field of Egyptology. We want to use this series to help strengthen the public’s awareness of the Egyptological community, and to illustrate the varied careers and on-going research projects within the discipline. Who is Dr. Campbell Price? Our inaugural interview is with Dr. Campbell Price from Manchester Museum in Manchester, England. Hailing originally from Scotland, Dr. Price completed his PhD at the University of Liverpool in 2011, where he researched the role of non-royal statues in temple spaces, focussing in particular on the Late Period. For over five years, he has been curator at Manchester Museum where he has redeveloped some of their galleries, while also organising some award-winning exhibits. We caught up with him by electronic owl in Manchester. Campbell Price: I am originally from Glasgow in Scotland, but (foregoing free tuition fees in my native land!) moved to Liverpool in England to study Egyptology. I clearly remember a visit to the major civic museum in Glasgow – Kelvingrove Museum and Art Gallery – when I was perhaps 5 years old. It had a certain smell – the ‘smell of antiquity’, you might say – or perhaps just polish. I remember seeing a mummy in the Egyptian section, and being fascinated. I did school projects on Egyptian themes whenever I could, and started amassing a collection of books that has since become a burden… When I was 16, I applied to Kelvingrove for a week of ‘work experience’ and was able to shadow the Ancient Civilizations Curator – which was instrumental to my choice to apply to Liverpool University to study Egyptology. NS: Why do you think it is important to study Egyptology? CP: It is incredibly important to have empathy for other cultures, of the past and today. To say it is important to study the past is meaningless – studying different perspectives is what is important, because it fosters empathy – which is vital to the welfare of modern society. Ancient Egyptian material offers a rich dataset to understand a different culture, with different conceptions to our own, and to discuss it with others – that is Egyptology. Egyptologists should be in the business of trying to understand the Egyptians, share their findings and interpretations, while being honest and open about their preconceptions and (re)constructions. 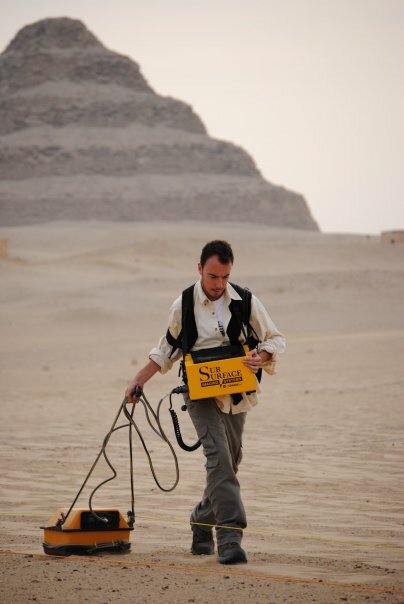 CP: My fieldwork in Egypt mainly consisted of several seasons at Saqqara, as part of the Scottish Saqqara Geophysical Survey Project. I remember the Director of the Mission, the much-missed Ian Mathieson, telling me when I joined as a student that if I slipped and fell down one of the numerous Late Period tomb shafts at Saqqara, I was first and foremost to “save the instrument” – Egyptology PhD students are 10-a-penny; Fluxgate gradiometers are not! NS: If you could travel back in time to see one ancient Egyptian site, which would it be? CP: I’d love to meet Senenmut and Hatshepsut at Deir el-Bahri – and ask what the hell they were up to! NS: What are you currently working on? CP: My work at Manchester Museum focusses on understanding the Egyptology collection and communicating it with the public. As part of this, I have been publishing a number of little-known pieces in the collection – including a ‘new’ statue of Senenmut, a Third Intermediate Period baboon and an unusual divine figure from Kahun. My main research interests are in non-royal sculpture of the Late Period, and this is the focus of a number of recent and forthcoming articles. I am (finally!) beginning to revise my PhD on this subject into a monograph. I have just completed a popular book entitled ‘Pocket Museum: Ancient Egypt,’ to be published by Thames and Hudson later this year. NS: If you could tell every person who comes to visit the Egyptian galleries at Manchester Museum one thing, what would it be? CP: All of the stuff you see before you gives you a skewed vision of ‘ancient Egypt’ – it almost all comes from elite tombs and doesn’t represent the ancient Egyptians in anything like a proper way…! NS: What is your favourite object in the Manchester Museum collection? CP: This changes almost daily, depending on what people ask about or what I have a chance to spend time with. A real favourite is the New Kingdom limestone ostracon with an inked sketch of a funeral – that is unique, to my knowledge. NS: What are your hopes for the future of Egyptology? CP: ‘Ancient Egypt’ is many things, and impossible to reconstruct in more than small parts. It allows the possibility for informed speculation, but this can be anchored in an understanding of a different life-world. My hope for the future is that more Egyptologists will acknowledge their own biases – and the biased nature of the surviving evidence. We don’t need more royal tombs (though we might get them…) – we need closed context insights into social practice. The Nile Scribes are grateful for Dr. Price’s willingness to participate in this new series. If you have any questions for Dr. Price, you can contact him online at the below sites, or leave a comment on the blog. Photos (unless otherwise indicated) are courtesy of Dr. Price and Manchester Museum. Readers- who would you like us to interview for this blog series? Leave your suggestions in the comments! I would like to read interviews with Dr Bill Manley , Dr Angela McDonald and Salima Ikram. Thanks for the suggestions, Debbie! We will see what we can do!